So I searched around a bit and couldn't find a topic that provides insights and techniques for refurbishing hubs and calipers. I was searching as I have sourced some 280zx components and would like them to be as near new as possible before installing them. Meaning, getting rid of crud, painting, and resealing. I'm sure I can figure it out via trial and error, but I would rather access the knowledge of therealm to avoid said errors. How to refurbish hubs properly? How to refurbish and rebuild calipers properly? PS - I started with removing bearings and races from the hubs, removing old grease, and soaking in Evaporust (wow...that stuff works great). Follow the FSM for rebuild of both, it's pretty straight forward and all of the parts are readily available. Hubs are just a grease container and a holder holder for the press in lug bolts and the bolt on rotor. The wheel bearing inside rides on an outer race that is easily knocked out with a drift and are replaceable. There is a press in rear grease seal, also replaceable. If the bearing is even slightly damaged it will growl often on turns or constantly. If quiet leave it alone. The tap in grease seal on the back side should always be replaced. (about $8 at Hartman's) Inspect the grease inside the hub for water or contamination. If water got in the bearing may now be bad. The cavity inside the hub can be emptied of old grease (dried thoroughly) and repacked. The rear bearing has to go in before the seal is pressed in. (use block of wood and hammer) Be sure to pack that bearing with grease and rub grease on the seal lips so they do not turn on the spindle while dry. Wash the front or outer bearing with solvent and dry, inspect and replace if needed. Grease well before installing. Setting the pre load is vital, but easily done, follow the FSM on this. Rebuilding the calipers is pretty straight forward, new seals, boot, piston, maybe sliders, degreasing, paint. One thing you need to know is removing the piston. Put a block of wood in front of the piston thick enough to leave about a 1" space. Remove zirk fitting and pressurize the the piston pushing it out of it's bore. Being careful to keep fingers from in front of the piston because it'll come out with some serious force if using a compressor. I used a bicycle pump and it blew out pretty easily but sometimes it takes a lot more force to remove than a simple bicycle pump. 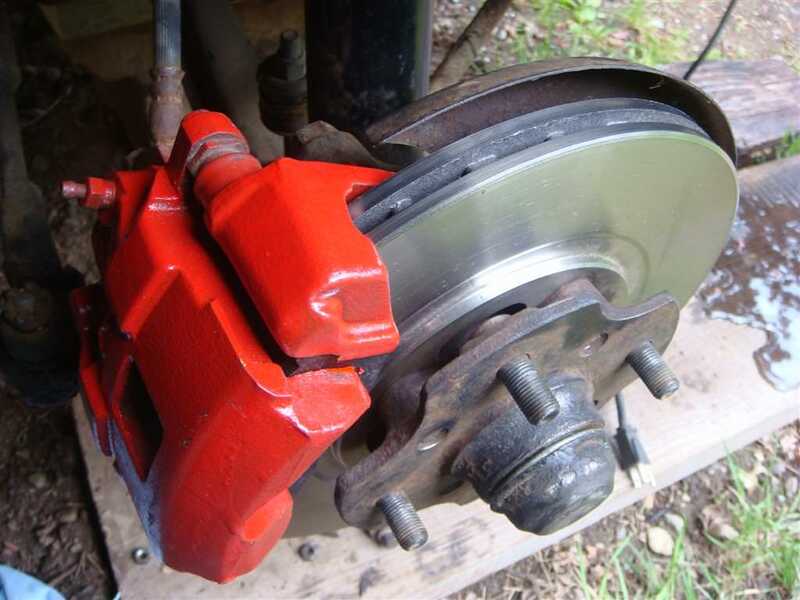 I rebuilt a set of 4x4 Toyota 4 piston calipers for my 620. In the kit there were square edged rubber rings just like piston rings and dust seals. Washed in soapy water and scrub brush very thoroughly. Lightly polished the bores with fine steel wool. (the equivalent of honing) Washed again. Had time so set in sun for the afternoon to dry. I guess an oven would also work. Again, clean and dry very thoroughly. Lubed everything with brake fluid and assembled. They worked perfectly, with never a problem and I did it myself. Cost was about $20 per caliper. Rebuilding the calipers definitely seems like the best way to go. 3B's & datzunmike...great suggestions for the calipers. Thank you. I do plan on painting the hubs and calipers. Any suggestions on brand/type of paint? Any technique tricks? For hub grease, what brand has shown to be of quality? I would rather buy a better brand/type to do it right than to go the cheap route and have to do it again. Any suggestions? DatzenMike...I'm curious about the rear grease seal, I'm not sure I am familiar. I've got a Haynes manual, but they are not the most useful. I always thought Chiltons was a better product. Jordan...thanks for passing on the nico link for the FSM. It will come in handy. Any other thoughts or insights would be great. Thanks everyone. Thanks datzenmike. I do remember this seal now. Ordered a set along with new caliper seals. How about suggestions for paint? I guess you could use any black spray on rust paint on the hub. I wouldn't bother as it isn't visible. If you have spoked after market or optional zx rims you could use a contrasting color that makes it stand out. My Maxima calipers have cheap red spray on rust paint. Thanks mike. When they are done, I'll post some pics.